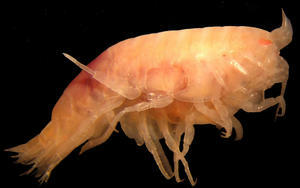 Two new species of submarine shrimp-like creature, capable of ‘stripping’ a pig carcass in a matter of days, have been discovered by a team of scientists from the National Oceanography Centre (NOC). These 3mm long scavenging crustaceans, known as amphipods, live in depths of up to 4500 metres in the North Atlantic Ocean. They act in swarms to strip the carcasses of dead marine animals, including whales, fish and seabirds. In order to catch these new species, scientists put mackerel bait in a trap and let it descend into the deep waters. When the traps were retrieved they contained up to 40,000 amphipods! The new amphipod species have been named in honour of the late, great taxonomist, Roger Bamber, who passed away in February this year. Taxonomy is the science of description, naming and classification of animals or plants. The two new species named are ­Paracallisoma idioxenos and Haptocallisoma lemarete. The study also describes two groups of closely related species (genera), one of which has been named Haptocallisoma, which means grasping in Greek, because their feet are able to cling to whatever they are eating. The amphipods were first discovered by NOC scientists off the coast of south-west Ireland, which is the nearest deep water to the UK. Similar creatures have also been discovered by the same scientists during environmental assessments for the oil and gas industry off the coast of Angola in West Africa. This research forms part of the NOC’s ongoing study of the deep-sea environment, in addition to the centre’s work with the oil and gas industry on environmental impact assessments.